Tim takes his Switch out with him in the tractor to help pass the time during the planting season. Tim is a farmer in Northern California who spends a lot of time on tractors. 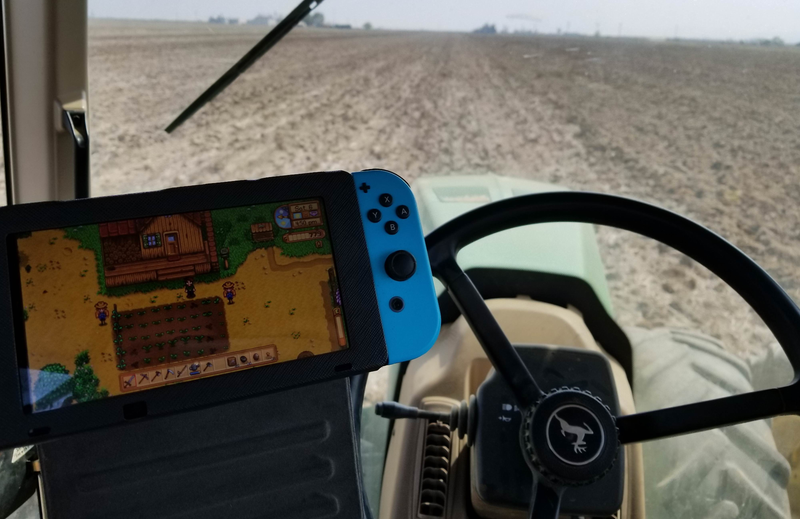 Thanks to auto-steering, that means he also has plenty of time to check in on his other farm, the one on his Switch port of Stardew Valley. Tim posted the picture of his setup to the Stardew Valley subreddit yesterday and has been answering questions about it ever since. Farming is hard work that involves long hours, but there’s also downtime. “My average speed in the field is less than 6 miles per hour,” he said in the comments of his post. “Literally every farmer with autosteer brings at least a book with them to kill the boredom.” That’s because during the planting season, like right now, his work mostly revolves around doing long passes in the field on a GPS-guided tractor. This leaves plenty of time to study, browse Reddit, and play his Switch. “I beat Breath of the Wild entirely in the tractor when it first came out,” Tim said in an email to Kotaku. More recently he’s taken to things like Minecraft and Stardew Valley. “To me Stardew Valley is more like relaxing and tinkering in my backyard garden than actual work, so it still has that escapism factor to me that something like Farming Simulator doesn’t have,” Tim said. Between the PC and Switch versions, he’s put about 200 hours in Stardew and is still playing. He elaborated even further in the comments of his Reddit post. “Farming is a casino and the mob bosses are mother nature and the world market. Some years you break the bank, some years they break your knee caps.” As fun as it might seem spending 10 hours in a tractor playing your Switch all day, it’s far from an easy life. I asked Tim if he had a favorite character. “Shane,” he said. “Because I connect to him on a pretty personal level with alcohol and depression, especially after I got out of the military I was pretty much exactly like him.” More recently, he says farm life has started to click for him as he’s gotten a better grip on its annual rhythms and also gotten more involved in his community and the local fire department. Tim wrote, “There’s really nothing quite like farming. It is hard, frustrating, and overwhelming at times, and it took me nearly 20 years to truly enjoy it, but there’s nothing else I’d rather do.” Although he admits it’s certainly better with a Switch on hand to keep him company on those long, slow drives. Who Is The Best Wife In Stardew Valley?